Boxelder Bugs (Boisea trivittata, order Hemiptera) were included along with several other notorious nuisance insects in my BYGL Alert titled, Fall Home Invaders are Poised to Enter (Sept. 30, 2017). They may have been poised then, but the bugs are now visiting homes en masse in southern Ohio. Indeed, I visited a home on Wednesday that was literally buggy with the bugs. The bugs range in size from 1/2" - 3/4" long. They are narrow-shaped, flat-backed, and dark gray or dark brownish-black. 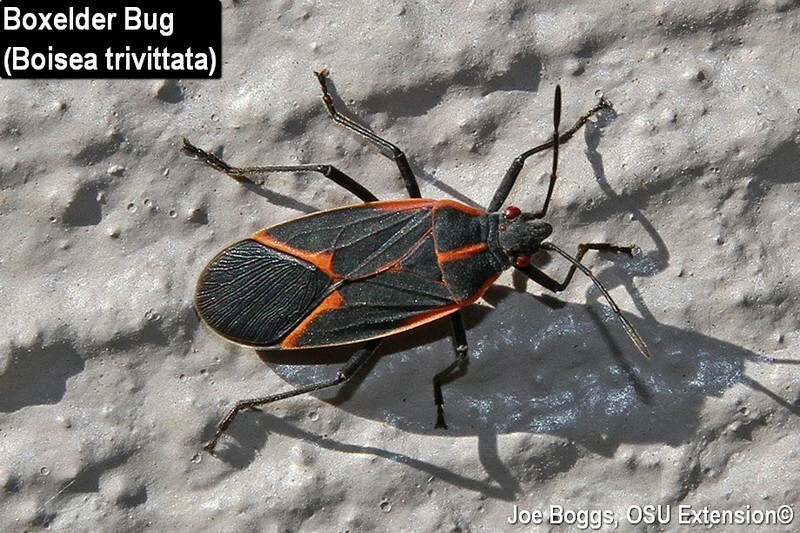 They have three highly visible orangish-red stripes running lengthwise on the pronotum, the area behind the head; "trivittata" is Latin for "three-striped". Boxelder bugs are seed-feeders. They are so-named because of a strong association with Acer negundo; however, both the adults and nymphs will commonly use their piercing-sucking mouthparts to draw juices from the seeds of other trees in the Acer genus. The home I visited did not have a boxelder in sight; however, there were two large silver maples (A. saccharinum) and one large sugar maple (A. saccharum) in the landscaping. I found bugs on all three trees. The bugs have also been observed feeding on alder, apple, buckeye, cactus, geranium, grape, honeysuckle, lilac, linden, oak, peach, plum, spirea, strawberry, and tulip. I'm aware of boxelder trees being cut down in an attempt to eliminate the bugs; however, their wide-ranging feeding activity illustrates why this management effort may fail. Our recent warm temperatures that followed a brief cold snap are driving the bugs to find overwintering sites which may include homes and other structures. As I noted in my previous report, the best offense against these bugs is a strong defense. It's not too late to seal-off possible entry points into homes and other structures. This strategy also works against Goldenrain Tree Bugs (Jadera haematoloma); a boxelder bug look-alike. This bug is another seed-feeder that belongs to the same family (Rhopalidae) as boxelder bugs. They also practice the same nuisance behavior as their boxelder brethren with large numbers appearing en masse on the sides of homes and other structures in the fall in an attempt of find overwintering sites. I first reported on goldenrain tree bugs appearing in Ohio in 2012. Their populations were even higher in 2013, then they simply disappeared. However, populations may be on the rebound (see The Return of an “Old Southern Friend”, June 28, 2017). The key to separating the two bugs is included in their scientific names. The specific epithet, "haematoloma," is Greek for "blood-fringed," and clearly describes the deep red "shoulders" (the edges of the pronotum) on the goldenrain tree bugs. Also, as their common name implies, goldenrain tree bugs are specific to their namesake host. I'd like to hear from you if you are seeing golden raintree bugs. Please drop me an e-mail with the location.